I love peppermint candies, chocolates, and assorted treats. There is something festive and comforting about eating peppermint around Christmas time. Who else loves this stuff? I think it’s one of those things that you either love or hate. 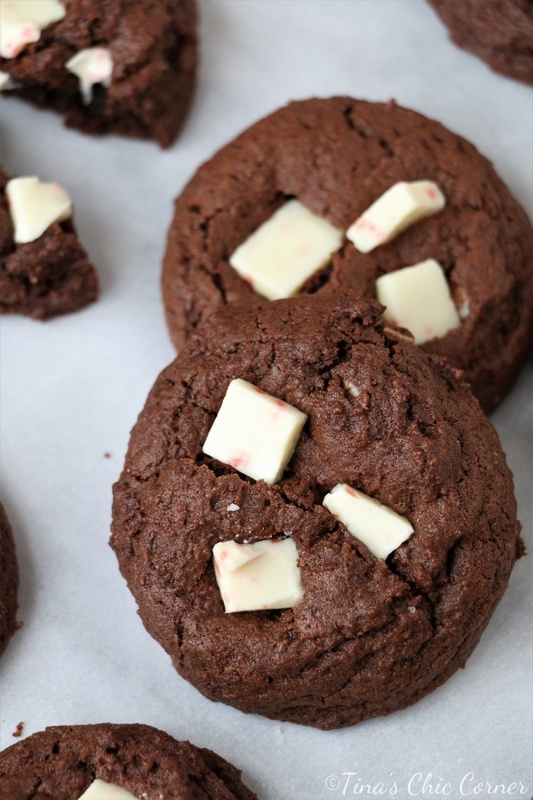 Anyway, since I have cookie baking on the brain, I decided to take one of my favorite chocolate cookie recipes and added white chocolate peppermint chips to them. Bam, it’s Christmas in a cookie. 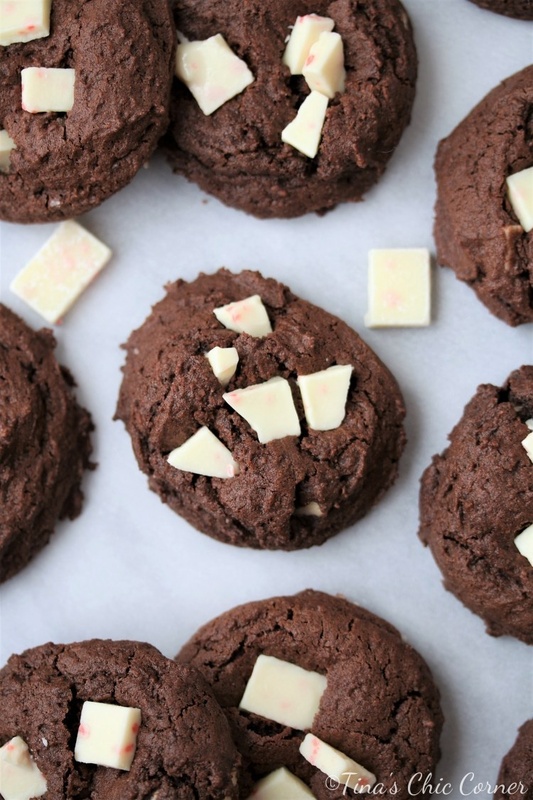 These cookies are very chocolaty. They have so much chocolate in them they almost seem like a fudgey brownie in cookie form. I love the white chocolate peppermint chips so much so that I’ve been eating them by the handful. No cookie required (but it is a bonus). They really take these chocolate cookies to a whole new yummy level. I bet they’d also taste great in a classic chocolate chip cookie too (just replace the chocolate chips). I have to remember to try that next time so my husband will like them more. 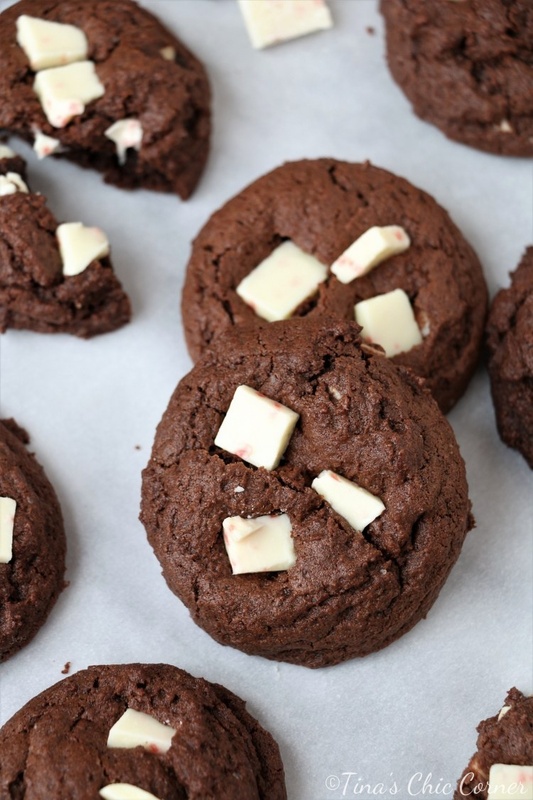 Now if you prefer to skip the peppermint chips but you are intrigued by these chocolate cookies (as you should be 😉 ) then go ahead and use chocolate chips (like the original recipe) or use white chocolate chips. You’ll still have an awesome cookie, but it just may not be as holiday festive (which is not a bad thing if you are reading this post in July). Lay parchment paper or a silicon mat on top of a cookie sheet. There is no need to grease it. 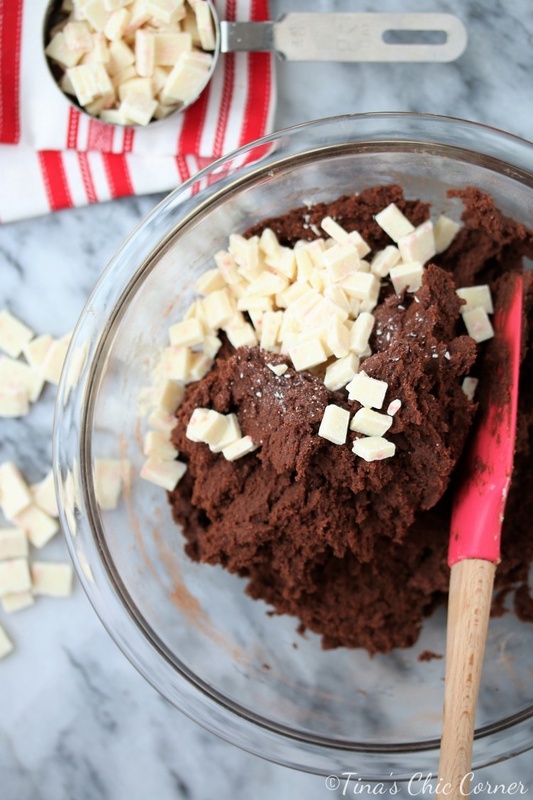 In a medium bowl, whisk together the flour, cocoa powder, baking soda, and salt. Set the dry ingredients aside. In a big bowl, cream the butter, white sugar, dark brown sugar, and vanilla extract. Stir in the peppermint chunks. Drop about 1 and 1/2 tablespoons of cookie dough per cookie onto the prepared cookie sheet. I used Oxo Good Grips Medium Cookie Scoop to help consistently scoop out the same amount of dough per cookie. Bake them for 9 to 11 minutes. I cooked mine for 10 minutes. Let them cool on the pan a little and then transfer them to a cooling rack to cool completely. These. Look. Amazing. 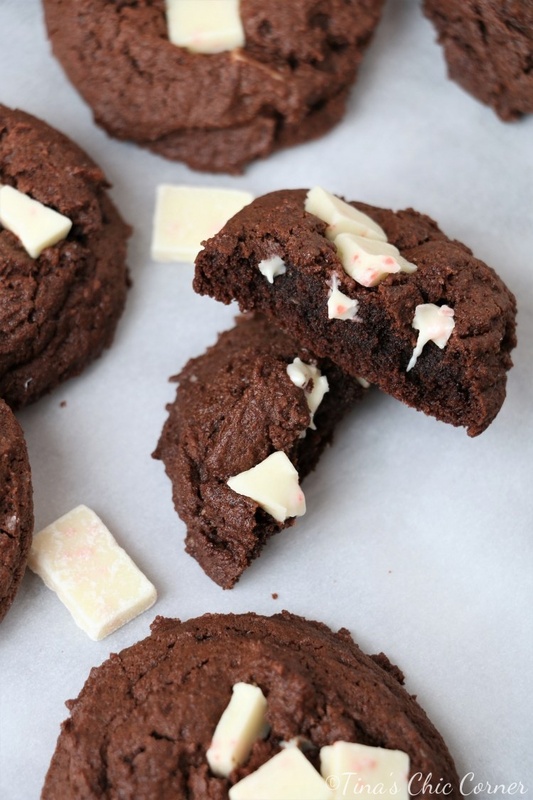 LOVE the chocolate peppermint combo in everything this time of year! Saving this right this second.